M. Publicius was Legatus Propraetor in 46-45 BC, and struck coins jointly with Pompeius Magnus. Gens Publicia, occasionally found as Poblicia or Poplicia, was a plebeian family at ancient Rome. Members of this gens are first mentioned in history during the period following the First Punic War, and the only one to achieve the consulship was Marcus Publicius Malleolus in 232 BC. Although the Publicii are not mentioned at Rome prior to the third century BC, they claimed descent from a legendary figure from the time of the kings. 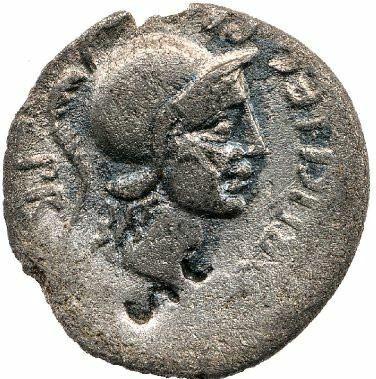 Ancus Publicius of Cora was said to have been one of the generals of the Latin League, together with Spurius Vecilius of Lavinium, in a war against the Romans during the reign of Tullus Hostilius, the third King of Rome, who claimed dominion over the cities of Latium following the destruction of Alba Longa.